The case brought against the state Senate for not allowing some entities to record its hearings goes to the Missouri Supreme Court next week. 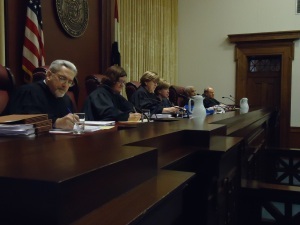 A Cole County judge dismissed the case brought by Progress Missouri. He said the Senate’s ability to create its own rules supercedes the Sunshine Law, and that as a separate branch of government, the judiciary can’t intervene. If it stands, the judge’s dismissal would mean it isn’t a violation of the state’s open records and meetings law for the Senate to prohibit groups from recording Senate committee hearings. Progress Missouri appealed the dismissal. Director Laura Swinford says the argument is simple. Swinford said prior to filing the suit her group tried to work with the Senate. The Senate says the Cole County judge was right to dismiss the case. The Supreme Court will consider Wednesday whether it did.